Glen Perkins was born in 1934 in St. Paul, Minnesota. He enlisted in the U.S. Air Force on June 25, 1952, and was trained as an aircraft mechanic. His first assignment was as a B-47 Stratojet mechanic with the 3542nd Maintenance Squadron of the 3540th Maintenance Group at Pinecastle AFB, Florida, from January 1953 to May 1955, followed by service as an RB-47 mechanic with the 61st Strategic Reconnaissance Squadron of the 70th Strategic Reconnaissance Wing at Little Rock AFB, Arkansas, from May 1955 to June 1958, when he was accepted for Officer Candidate School. 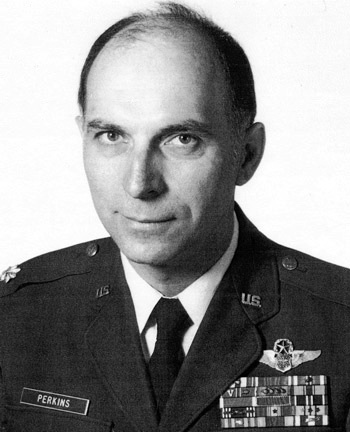 Perkins was commissioned a 2nd Lt in the U.S. Air Force on December 19, 1958, and then attended the Communication Officers Course at Keesler AFB, Mississippi, from December 1958 to December 1959. He served with the 46th Communications Squadron at Barksdale AFB, Louisiana, from January 1960 to March 1961, and then went through Undergraduate Navigator Training at Harlingen AFB, Texas, receiving his Navigator wings in December 1961. Lt Perkins then completed Electronic Warfare Officer training and B-52 Stratofortress Combat Crew Training before serving as a B-52 EWO with the 325th Bomb Squadron at Fairchild AFB, Washington, from December 1962 to February 1966. Capt Perkins then served as an EB-66 Destroyer EWO with the 41st Tactical Reconnaissance Squadron at Takhli Royal Thai AFB, Thailand, from February 1966 until he was forced to eject over North Vietnam and was taken as a Prisoner of War on July 20, 1966. After spending 2,400 days in captivity, Maj Perkins was released during Operation Homecoming on February 12, 1973. He was briefly hospitalized to recover from his injuries at Maxwell AFB, Alabama, and then received an Air Force Institute of Technology assignment to complete his Bachelor's degree at Florida Tech University in Orlando, Florida, from September 1973 to August 1976. Col Perkins served at Ellsworth AFB, South Dakota, from September 1976 until his retirement from the Air Force on December 31, 1978. His final assignment was as commander of a munitions maintenance squadron at Ellsworth from December 1977 to December 1978. During his last assignment, Glen earned his private pilots license and became an instructor pilot, accumulating over 7,000 flying hours over the next 13 years, including 5,000 hours as an instructor. He and his wife Kay have four children, eleven grandchildren, and two great grandchildren. 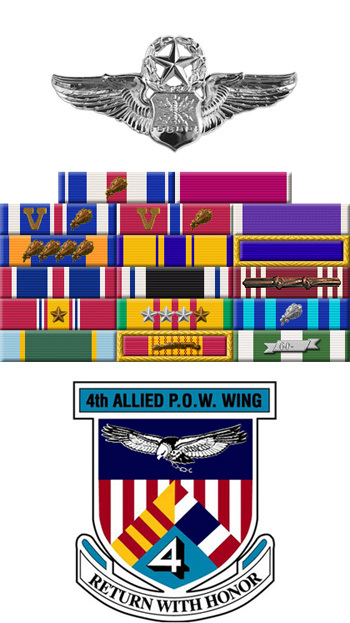 For the period 13 September 1967 to 18 October 1967: This officer distinguished himself by gallantry and intrepidity in action in connection with military operations against an opposing armed force during the above period while a Prisoner of War in North Vietnam. Ignoring international agreements on treatment of prisoners of war, the enemy resorted to mental and physical cruelties to obtain information, confessions, and propaganda materials. This individual resisted their demands by calling upon his deepest inner strengths in a manner which reflected his devotion to duty and great credit upon himself and the United States Air Force.